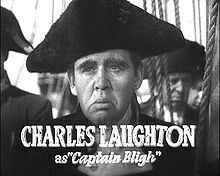 Charles Laughton (1 July 1899 – 15 December 1962) was an Anglo-American actor, screenwriter, producer, and director. He was born in Scarborough, North Riding of Yorkshire. He is known for playing Quasimodo in The Hunchback of Notre Dame and Captain Bligh in Mutiny on the Bounty. He directed The Night of the Hunter. He won the 1933 Academy Award for Best Actor in a Leading Role for The Private Life of Henry VIII. Laughton was bisexual. He was married to actress Elsa Lanchester from 1929 until his death. The couple became American citizens in 1950. They had no children. Laughton died of kidney cancer in Hollywood, Los Angeles. This page was last changed on 21 January 2019, at 06:10.